There are few words more entwined within our company’s DNA than ‘people’. We recognise People as one of the four ‘pillars’ that support the CSG brand, making us what we are, defining our success. If you spend any time with our MD, Neil Richards, you’ll soon learn that his mantra “it’s all about the people” is more than just a handy catchphrase, it’s a deeply-held philosophy. With that in mind, it’s inconceivable that we wouldn’t dedicate a quarter of our focus on the way our people can contribute to ever-higher safety standards. Our Compliance Manager, Sarah Taylor explains further. “The obvious way to bracket the issues raised by Health & Safety considerations with the people who are relied upon to enact them is to provide lots of training – to simply ensure that people know what’s expected of them. Of course that’s important and we can all agree that an element of training will always be necessary but we believe the answer goes much further than that. “Anyone who works in Health & Safety will tell you that proactive measures are better than reactive so we’re always looking for extra ways to improve everyone’s health and safety, avoiding the need to react to a future situation. For the first time this year, we’re also developing a structured approach to supporting mental health as well as physical health. Not only is mental health becoming a better- understood topic in the wider world, it’s also increasingly clear that a healthier workforce demonstrably acts in a safer way. Today, as mental health is better understood, the issues it raises are more openly discussed in the media, with Stephen Fry and Alistair Campbell among the most prominent advocates for changing attitudes. It’s therefore no surprise that Matt Haig’s personal account of his struggles – and his approach to confronting them – Reasons To Stay Alive, remains a bestselling book, almost three years after it was first published. 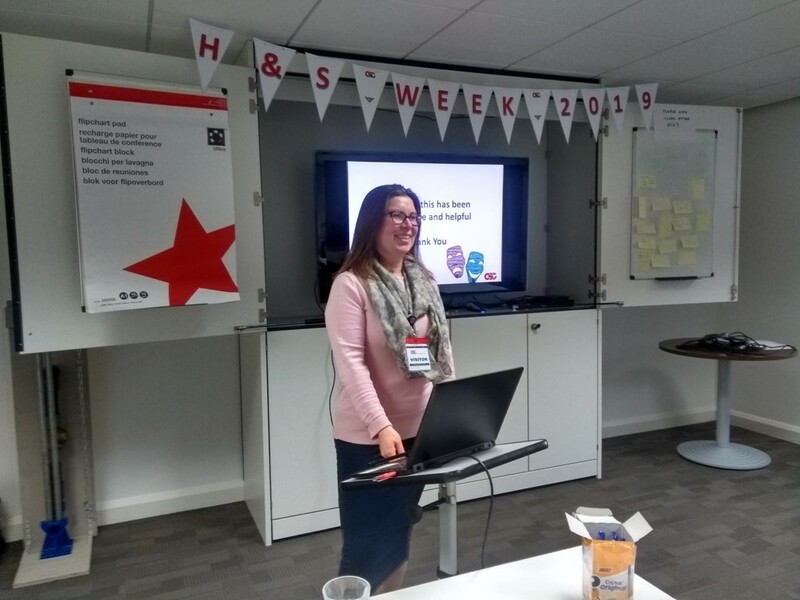 Since last year’s inaugural Health & Safety Week, all employees have been given the opportunity to receive counselling, in the strictest confidence, via a third party company – a facility that will continue to be provided in 2019. CSG also offer opportunities to work on physical fitness (a 5-a-side football team established at our Cadishead depot is still going strong, a year on) and various work-shadowing schemes, to build understanding and engagement between different departments. Together with the necessary training and the focus on mindfulness, it’s a comprehensive approach to ensuring that meeting Health & Safety objectives really is something in which every employee has a stake. When employees at our Cadishead plant were interviewed as part of our Investors In People accreditation, it was notable how many of them were able to give examples of safety concerns being reported and resolved. The trend is reflected in our ‘Accidents, Incidents and Near Misses’ statistics, which show a distinct increase in reports logged. At first glance, doesn’t this seem concerning? With issues of Health & Safety – and of corporate culture – the ‘task’ is never completed, it will always require careful maintenance of standards. We will always need to keep re-defining what “safe” looks like and relying on our people to ensure that our operations never fall outside of that definition. The engagement of our employees in expecting – and achieving – higher safety standards is yet another indication that it really is “all about the people”.